The National Radio Astronomy Observatory (NRAO) suspended its United States operations Friday (Oct. 4) after the government shutdown forced the large astronomy organization to temporarily close its doors. The NRAO has closed three telescopes: the Very Large Array, the Very Long Baseline Array, and the Green Bank Telescope. The organization is also responsible for helping to run the giant ALMA radio telescope (Atacama Large Millimeter/submillimeter Array) in Chile, but that facility can still remain open for three to four weeks, ScienceInsider reports. "All NRAO facilities and buildings are closed; NRAO personnel, other than a skeleton crew, are on furlough and cannot respond to emails or phone calls," NRAO officials wrote in a statement on the observatory's website. NRAO events schedule to take place at the facilities are also cancelled until further notice. Telescope shutdown is no small task, Anthony Beasley, NRAO director, told ScienceInsider. A skeleton crew of will need to remain at the facilities to monitor sensitive instrumentation like the cryogenically cooled electronics necessary for these kinds of telescope observations. About 385 NRAO employees are now unable to work, with approximately 90 people still manning the telescopes, ScienceInsider reports. “We were able to cruise out for a couple of days from the shutdown, but we couldn’t keep going,” Beasley told ScienceInsider. The Green Bank Telescope in West Virginia is the most sensitive single dish radio telescope on Earth and the Very Large Array is composed of 27 telescopes. The Very Long Baseline Array is 10 telescopes spread across Hawaii to the Virgin Islands. The $1.3 billion ALMA telescope is a project managed by NRAO, the European Southern Observatory and the National Astronomical Observatory of Japan. 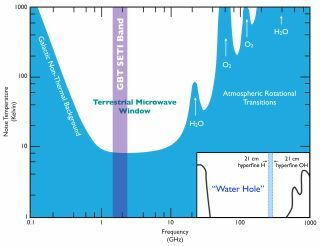 The powerful array — which recently reached its full power with 66 antennas on Sept. 30 — can peer deeper into long-wavelength millimeter light than any other instrument. NASA has also been hard-hit by the government shutdown. The space agency has had to furlough most of its 18,000 employees. Less than 600 staff members are able to continue working through the shutdown. NASA's public websites are not being updated and the agency's social media accounts will not be maintained through the duration of the shutdown. Mission Control responsible for supporting astronauts occupying the International Space Station will remain functional to protect the crew flying high above Earth.